Last week I received the elBulli Texturas MiniKit that I ordered from the UK. Not only did it include the groovy Texturas ingredients, but also the tools and guidebook that I needed to really jump into this brave new world. 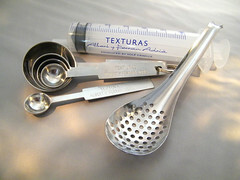 The tools that came with the elBulli Texturas kit included a collecting (straining) spoon, measuring spoons and a syringe. I have to say, there is something sort of thrilling about using tools with “Albert Y Ferran Adrià” ENGRAVED on them. It’s silly, but it makes the experience a little more special. The phrase “Molecular Gastronomy ” (or molecular cooking) used to scare me. It sounded like brainy “science fiction” gibberish, especially when I started reading about techniques called “spherification” and “emulsification”. My current obsession with it began after I attended a “Molecular Gastronomy” class in November. The next day I started ordering the special ingredients and tools, then created a “molecular cooking” corner in my funky, vintage kitchen. During that first class, our instructor (the awesome Chef Michael Young) demonstrated how to make Ferran Adria’s fruit caviar, but I didn’t actually get to try the caviar recipe that day. A couple of years ago, I remember being dumbfounded while watching Ferran and Albert Adrià working at their elBulliTaller (laboratory) in Barcelona, Spain. It was on Anthony Bourdain’s “No Reservations” episode titled “Decoding Ferran Adrià“. The brothers Adrià were showing Bourdain how to make mango “caviar” and I thought, “I wish I could do THAT in my kitchen!”. Well I’m very proud to say that yesterday… I did it. I spent all afternoon making various sizes of elBulli “caviar”. It was AWESOME. 3. And most of all… ENTHUSIASM! 1. In one of the medium bowls, fill with cold water until the bottom is covered up to about four inches. Set this water bath aside. 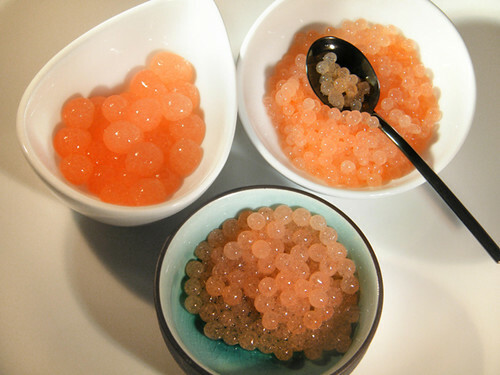 It will be used as the final step in making the fruit caviar. 2. 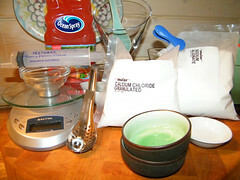 In the large bowl, mix the sodium alginate with 1/2 the fruit juice and blend till completely dissolved. 4. Strain into empty medium bowl and allow to sit to remove any air bubbles. 5. 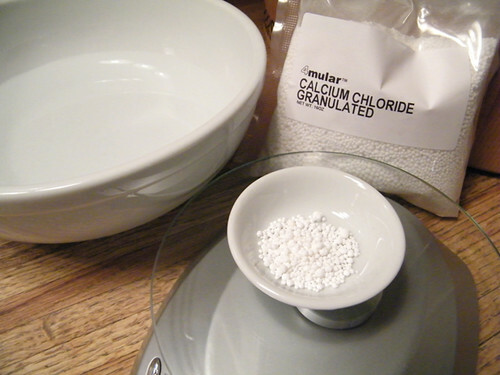 In a medium bowl, dissolve the calcium chloride in the 18 oz. of cold water. 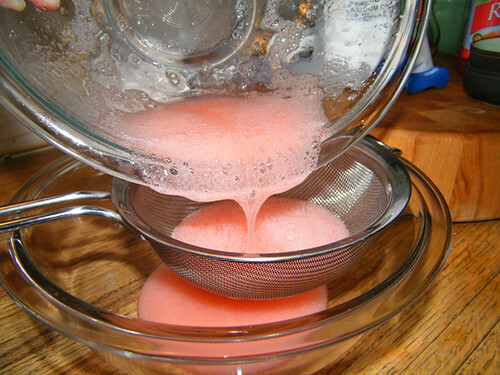 I used a small whisk and it took about a minute to be completely dissolved. 6. Fill syringe or squeeze bottle with the juice mixture. It will be a little thick and “goopy”. 7. 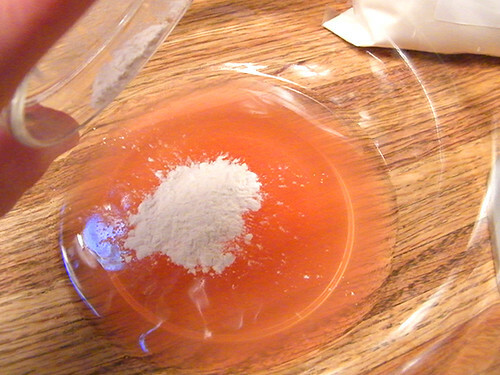 Gently discharge the mixture into the calcium chloride bath drop by drop. 8. 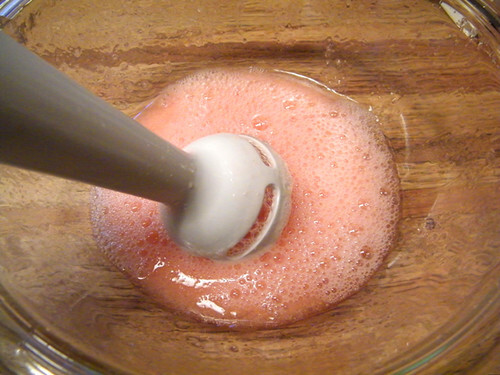 After a minute, gently remove the “caviar” using a straining spoon and add to the cold water bath. 9. 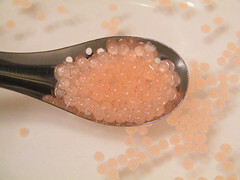 Wait a couple of minutes then remove the “caviar” from the fresh water into a serving bowl or serving spoon. Note: I had a kitchen towel folded next to the water bath. Right after removing a spoonful of caviar (with the straining or collecting spoon), I gently tapped the bottom of the spoon onto the towel and it removed the excess water. I see Ferran Adrià’s “Liquid Olives” in the very near future!!! Infusions LTD sells an elBulli “mini starter kit”. Be sure to look out for a terrific molecular cooking episode of “Gourmet’s Diary of a Foodie” titled “The Inventors” (the series is currently in reruns). It features Herve This, PolyScience inventor Philip Preston (Anti-Griddle and Immersion Circulators) and Nathan Myhrvold, a former CTO of Microsoft turned Sous-Vide master. Short video clip here. Very excited to meet Ferran Adria! Awesome JO… I NEED to order my kit ASAP!!!!!!!! gambler72, Just an FYI. You really don’t need the actual elBulli Texturas kit to make the “caviar”. Basically if you have a squeeze bottle or meat “flavor injector” syringe, and an immersion hand mixer, all you would need is the Calcium Chloride and Alginate. It’s available here http://www.le-sanctuaire.com (click on search to find the products). Happy New Year! This looks like so much fun! I’m definitely interested in getting some of these chemicals to play around with. Hi Martin, Thanks so much. I regularly read Khymos and am always inspired! Caught this blog entry because of your facebook pictures. Really fascinating. I love Ferran Adria and his brother. I may end up trying this myself. Hopefully we’ll be heading out to Catalunya this May. Although I won’t be able to eat at El Bulli I’ll be even closer to dream. Hi Jo I have added you to my blogroll! you do some nice things, but one tip for the caviar, it literally takes hours for the airbubbles from the blender to come out again, so I suggest you leave the juice oivernight in the fridge. the result will be crystal clear caviar! Atwork we use a vacuum packer to quickly extract the air. 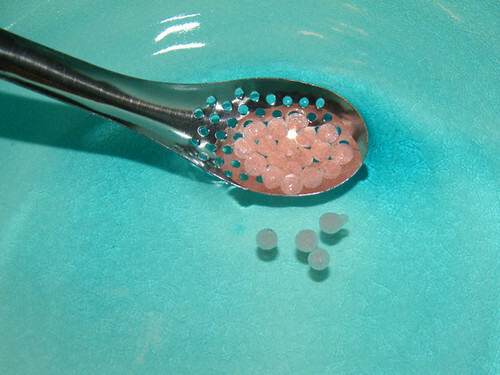 Hi im new to the whole molecular gastronomy thing, but i ordered in some of the chemicals needed and found this web site and decide to try their version of the grapefruit caviar first. I made sure to follow the recipe to the t but for some reason the grapefruit and alginate solution does not form in the calcium bath, instead it just disipates into nothing. And when i add more alginate to the point that the spheres do form the solution just gets to thick and the spheres are extremely week. I was just wondering if any one had any advise. I’m still new to molecular cooking too but have a few questions. I will also forward your question to my molecular gastronomy instructor. 1. Did you purchase “food grade” calcium chloride? I’m only asking because I made the mistake of buying it on Amazon and the calcium chloride I bought was for fish tank use! My instructor told me it had to be “food grade”. 2. 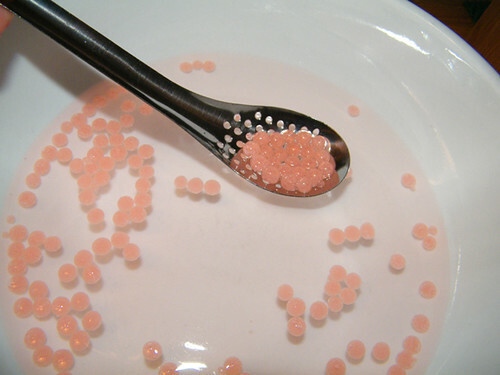 Did you allow the mixed sodium alginate and fruit juice to sit, so the bubbles would go away? 3. Was your fruit juice 100%? thanks for the quick reply, I did make sure to by the ingredients food grade of line at le’piceri, i think that allowing the alginate mixture to sit my be one of the problems i will make sure to try it out next, and the fruit juice does say 100% on it. But how thick should the fruit and alginate mixture be? it always seems to be very gelatinized before i even drop it into the calcium bath, or else there is no reaction at all. 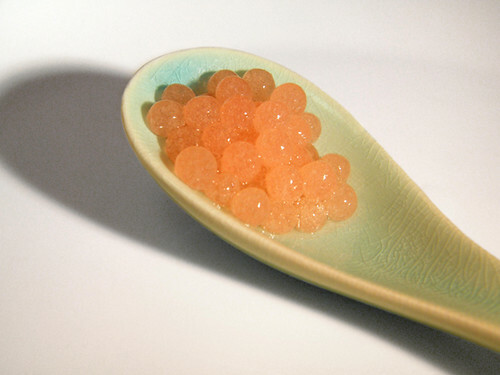 The few times I’ve made the fruit caviar, the liquid was still pretty runny… maybe a little thicker than honey. Are you using a digital scale to measure the alginate? I’ve made the mistake of forgetting to switch the conversion button before. So instead of one gram, I incorrectly weighed one ounce. i have been using digital scale I went back to check and it is set on grams. i tried again and they seems to be forming when i drop them in now with ratios you gave me but they dont seem to hold together when i try and take them out into the water bath. Oh and i had another question, should they sink or float when i drop them into the calcium bath? The caviar I made definitely float after coming in contact with the calcium chloride. So i am starting to think that whatever i do this whole fruit caviar thing is not going to work out. 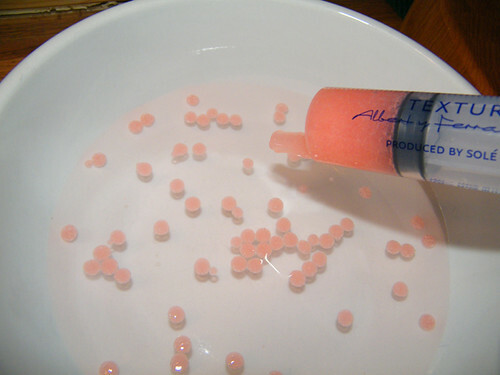 It seems that if i only use 1 g of the alginate nothing with form in the calcium bath, and if i use closer to 5g the spheres will form but they wont stay together when i try and take them out, instead they just flatten and break. I appreciate the help so far but if there are any other suggestions it would be greatly appreciated. Hi Jordan, When I hear back from my molecular gastronomy instructor I will let you know. He’s opening a new restaurant right now, so I know he’s been really busy. Thank you for the help i really appreciate it. Sorry for the delay… we are days out and lots to do…but I wanted to respond quickly. Grapefruit is tough when it comes to spherification. It has a very high acid level, second to lemon. This will inhibit the spherification from holding, essentially just dissolving the walls. Jordan, Have you tried apple juice? No not yet but, i had something about using sodium citrate to raise the PH of the juice so ordered some, it should be in soon. But I will try apple juice next. Thank your professor for me, and thank you for your help. But one more question, do you maybe know anything about how much sodium citrate i might need to lower the acidity level to allow the spherification process? Wow! Thanks for this. I am late to the spherification process but excited since reading your blog. How long and how do you store the caviar? I think the most was a few hours, and it got harder and harder. The original texure held for about 30 minutes. Thank you for the information. I am going to try this out with the manual syringe and then if I can get it to work for me, I’m going for a pipette with multiple channels. You’ll even find products that European chefs are discovering (not industrial technologists, these products have been out about as long as the others – sometimes a few thousand years…) that are not in Texturas’s list : there is more to MG than one chef’s however innovative knowledge and know-how. hey, I’d like to know if this can be done with strawberry, I’ve tried it but the mixture fell apart in the Calcium bath. Awesome! I’m just learning about the innovation of fruit caviar. I am definitely intrigued, and would love to try this in my kitchen someday. Thanks for sharing the step-by-step process of your experiment. I thoroughly enjoyed reading this entry. Excellent guide! I JUST got my calcium chloride and sodium algimate. I will be using this recipe tomorrow! Can anyone tell me how long the caviar keeps for? Just wondering if its something I could make in the afternoon to take to a party? We made it again at Thanksgiving (with cranberry juice) and they caviar held fine for a few hours. They do get a bit harder, but still worked fine. I am a Culinary Arts high school teacher and would love to teach this to my bakery & pastry class. Really cool !!! Loved it !